Sam Bradford has been the Vikings' starting quarterback since Week 2 of the 2016 season. The Minnesota Vikings are a professional American football team based in Minneapolis. They are members of the North Division of the National Football Conference (NFC) in the National Football League (NFL). A franchise was granted to Minneapolis businessmen Bill Boyer, H. P. Skoglund and Max Winter in 1959 as a member of the American Football League (AFL). The ownership forfeited their AFL membership in January 1960 and received the National Football League's 14th franchise on January 28, 1960 that started play in 1961. The Vikings have had 36 starting quarterbacks (QB) in the history of their franchise; they have never had more than three starting quarterbacks in one season. [a] The Vikings' past starting quarterbacks include Pro Football Hall of Fame inductees Fran Tarkenton, Brett Favre and Warren Moon. The team's first starting quarterback was George Shaw; he was replaced by Tarkenton in the franchise's first game, and the future Hall of Famer retained the starting role for most of the remainder of the season. As of the 2016 season, Minnesota's starting quarterback is Sam Bradford who the Vikings traded for after Teddy Bridgewater, was injured prior to the start of the 2016 season. The Vikings' starting quarterback for the first game of their inaugural season against the Chicago Bears was George Shaw. However, he was replaced by Fran Tarkenton early on, who passed for four touchdowns in the game and rushed for one more. Tarkenton went on to start in 10 of the Vikings' 14 regular season matches that year. He played for the Vikings until 1967, when he was traded to the New York Giants, and Joe Kapp took his place as the Vikings' starting QB. Kapp led the Vikings to their first playoff appearance in 1968, but he was traded to the Boston Patriots in 1970 and Gary Cuozzo stepped up to replace him. Cuozzo remained in the position for two seasons, moving to the St. Louis Cardinals in 1972. Tarkenton returned for another seven-year spell as the Vikings' starting quarterback in 1972, continuing until his retirement in 1978, at which point Tommy Kramer was promoted from the second string in his second season with the franchise. Kramer was injured for most of the 1983 season, so Steve Dils served as the starting quarterback for most of the season, before Kramer reclaimed the position in 1984. For the 1987 season, Kramer shared QB duties with Wade Wilson, before Wilson took over on a permanent basis from 1988. Wilson was replaced by the emerging Rich Gannon in 1990, but Gannon was released after the 1992 season and veteran Jim McMahon took over for the 1993 season until the arrival of Warren Moon in 1994. 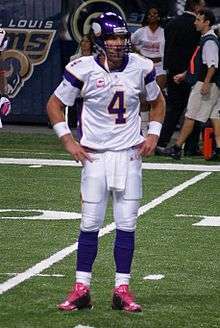 Moon retained the starting QB spot for two seasons, but suffered a broken collarbone halfway through his third season with the Vikings and was replaced by Brad Johnson for the remainder of the season. The Vikings had three starting quarterbacks in the following three seasons – Johnson (1997), Randall Cunningham (1998) and Jeff George (1999) – before Daunte Culpepper began a six-year spell in his second year in the NFL in 2000. He suffered a serious knee injury during the 2005 season, and Johnson took over in the position again, having re-signed the previous summer after seven years away from the franchise. Culpepper then joined the Miami Dolphins in 2006, giving Johnson another full year as starting QB, only to be replaced by sophomore Tarvaris Jackson in 2007. The 2008 season commenced with Jackson starting at quarterback, but he was replaced after two games by Gus Frerotte, who was returning to the Vikings from the St. Louis Rams after having been traded to the Miami Dolphins in 2005. Jackson regained the job for the final three games and led the Vikings to their first divisional title since 2000, and their first NFC North title. In 2009, the Vikings recruited veteran QB Brett Favre out of retirement to be their new starting quarterback. In Week 13 of the 2010 season, Favre suffered a chest injury that ended his NFL-record streak of consecutive starts at 297 (321 including postseason games), and Tarvaris Jackson reclaimed the starting spot for Week 14. However, Jackson was injured himself in Week 15, giving rookie Joe Webb a chance to stake a claim for the position. He was unable to hold onto the position as Donovan McNabb was signed as a free agent to replace Favre, who retired at the end of the 2010 season. After going 1–5 through the first six games of 2011, though, McNabb was replaced by first-round draft pick Christian Ponder, who retained the starting position for the remainder of the season and for the whole of 2012. However, he was plagued by indifferent form and the Vikings signed Matt Cassel – recently released by the Kansas City Chiefs. When Ponder suffered an injury early in the 2013 season, Cassel was given his first start for the Vikings in week 4 in the NFL International Series game against the Pittsburgh Steelers at Wembley Stadium, London. He started the following game, but was replaced in week 7 by Josh Freeman, recently signed after his release by the Tampa Bay Buccaneers. However, he was injured during the game and did not make another start for the Vikings, allowing Ponder to reclaim the starting role. Cassel then returned as the starter in week 14, and retained the role for the rest of the season and into 2014. After three games, he was placed on injured reserve and first-round draft pick Teddy Bridgewater took over for the week 4 game against the Atlanta Falcons. Bridgewater himself was injured late in the game, allowing Ponder the chance to come back in for the following week, but the rookie soon returned and has held the starting berth until suffering a knee injury in practice during the 2016 preseason. Shaun Hill started the season opener and Sam Bradford took over in week 2. Seven Vikings quarterbacks have made at least one start in their rookie season: Tarkenton in 1961, Vander Kelen in 1963, Kramer in 1977, Jackson in 2006, Webb in 2010, Ponder in 2011 and Bridgewater in 2014. 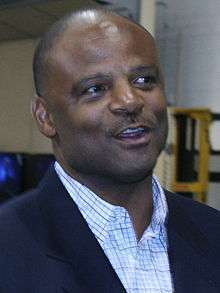 Pro Football Hall of Fame inductee Warren Moon was the Minnesota Vikings' starting quarterback from 1994 to 1996. Daunte Culpepper was the Vikings' starting quarterback for six seasons from 2000 to 2005. Jim McMahon was the Vikings' starting quarterback for the 1993 season. Brett Favre took over as the Vikings' starting quarterback in 2009. Teddy Bridgewater has been the Vikings' starting quarterback since Week 4 of the 2014 season until the end of the 2015 season. He tore his ACL on August 30, 2016, and was declared out for the rest of the 2016 season. Having been the franchise's starting quarterback for 13 seasons (longer than any other Vikings player), Fran Tarkenton holds the record for the most starts in a Vikings jersey, and those for the most wins and ties. He is also the franchise's leading passer in terms of numbers of attempts, completions, total yards gained and passing touchdowns, although Brett Favre has the best pass completion percentage. However, Tarkenton has also thrown the most interceptions. The record for the longest completed pass by a Vikings starting quarterback is held by Gus Frerotte, who threw a 99-yard touchdown pass to wide receiver Bernard Berrian in a home game against the Chicago Bears in the 2008 season. Tarkenton is also the franchise leader for rushing attempts and rushing yards as a quarterback, but it is Daunte Culpepper – with 72 fewer rushing yards on 10 fewer attempts than Tarkenton – who has the most rushing touchdowns. Joe Webb holds the record for the longest rush with a 65-yard run in Minnesota's 34–28 road loss to the Detroit Lions in 2011. * Statistics accurate as week 13 of the 2016 season. "Minnesota Vikings Team Encyclopedia". Pro-Football-Reference.com. Sports Reference. Retrieved December 31, 2009. ↑ "Vikings – Team History". Pro Football Hall of Fame. Retrieved November 4, 2009. 1 2 "Hall of Famers". vikings.com. Minnesota Vikings Football. Retrieved November 5, 2009. 1 2 3 "George Shaw". Pro-Football-Reference.com. Sports Reference. Retrieved November 4, 2009. 1 2 "1961 Minnesota Vikings Starters, Roster, & Players". Pro-Football-Reference.com. Sports Reference. Retrieved November 4, 2009. 1 2 3 4 5 6 7 8 9 "Fran Tarkenton". Pro-Football-Reference.com. Sports Reference. Retrieved November 4, 2009. 1 2 3 4 5 6 "Joe Kapp". Pro-Football-Reference.com. Sports Reference. Retrieved November 4, 2009. 1 2 "1968 Minnesota Vikings Starters, Roster, & Players". Pro-Football-Reference.com. Sports Reference. Retrieved November 4, 2009. 1 2 3 4 5 "Gary Cuozzo". Pro-Football-Reference.com. Sports Reference. Retrieved November 4, 2009. 1 2 3 4 5 6 7 "Tommy Kramer". Pro-Football-Reference.com. Sports Reference. Retrieved November 4, 2009. 1 2 3 "Steve Dils". Pro-Football-Reference.com. Sports Reference. Retrieved November 4, 2009. 1 2 3 4 5 6 "Wade Wilson". Pro-Football-Reference.com. Sports Reference. Retrieved November 4, 2009. 1 2 3 "Rich Gannon". Pro-Football-Reference.com. Sports Reference. Retrieved November 4, 2009. 1 2 3 4 "Jim McMahon". Pro-Football-Reference.com. Sports Reference. Retrieved November 4, 2009. 1 2 3 4 "Warren Moon". Pro-Football-Reference.com. Sports Reference. Retrieved November 4, 2009. 1 2 3 4 5 6 7 "Brad Johnson". Pro-Football-Reference.com. Sports Reference. Retrieved November 4, 2009. 1 2 3 4 5 "Randall Cunningham". Pro-Football-Reference.com. Sports Reference. Retrieved November 4, 2009. 1 2 3 4 "Jeff George". Pro-Football-Reference.com. Sports Reference. Retrieved November 4, 2009. 1 2 3 4 5 6 "Daunte Culpepper". Pro-Football-Reference.com. Sports Reference. Retrieved November 4, 2009. 1 2 3 4 5 6 "Tarvaris Jackson". Pro-Football-Reference.com. Sports Reference. Retrieved December 30, 2010. 1 2 3 "Gus Frerotte". Pro-Football-Reference.com. Sports Reference. Retrieved November 4, 2009. 1 2 3 4 "Brett Favre". Pro-Football-Reference.com. Sports Reference. Retrieved December 30, 2010. ↑ "1962 Minnesota Vikings Starters, Roster, & Players". Pro-Football-Reference.com. Sports Reference. Retrieved November 4, 2009. ↑ "1963 Minnesota Vikings Starters, Roster, & Players". Pro-Football-Reference.com. Sports Reference. Retrieved November 4, 2009. 1 2 "Ron Vander Kelen". Pro-Football-Reference.com. Sports Reference. Retrieved November 4, 2009. ↑ "1964 Minnesota Vikings Starters, Roster, & Players". Pro-Football-Reference.com. Sports Reference. Retrieved November 4, 2009. ↑ "1965 Minnesota Vikings Starters, Roster, & Players". Pro-Football-Reference.com. Sports Reference. Retrieved November 4, 2009. ↑ "1966 Minnesota Vikings Starters, Roster, & Players". Pro-Football-Reference.com. Sports Reference. Retrieved November 4, 2009. 1 2 "Bob Berry". Pro-Football-Reference.com. Sports Reference. Retrieved November 4, 2009. ↑ "1967 Minnesota Vikings Starters, Roster, & Players". Pro-Football-Reference.com. Sports Reference. Retrieved November 4, 2009. ↑ "1969 Minnesota Vikings Starters, Roster, & Players". Pro-Football-Reference.com. Sports Reference. Retrieved November 4, 2009. ↑ "1970 Minnesota Vikings Starters, Roster, & Players". Pro-Football-Reference.com. Sports Reference. Retrieved November 4, 2009. 1 2 3 4 "Bob Lee". Pro-Football-Reference.com. Sports Reference. Retrieved November 4, 2009. ↑ "1971 Minnesota Vikings Starters, Roster, & Players". Pro-Football-Reference.com. Sports Reference. Retrieved November 4, 2009. 1 2 "Norm Snead". Pro-Football-Reference.com. Sports Reference. Retrieved November 4, 2009. ↑ "1972 Minnesota Vikings Starters, Roster, & Players". Pro-Football-Reference.com. Sports Reference. Retrieved November 4, 2009. ↑ "1973 Minnesota Vikings Starters, Roster, & Players". Pro-Football-Reference.com. Sports Reference. Retrieved November 4, 2009. ↑ "1974 Minnesota Vikings Starters, Roster, & Players". Pro-Football-Reference.com. Sports Reference. Retrieved November 4, 2009. ↑ "1975 Minnesota Vikings Starters, Roster, & Players". Pro-Football-Reference.com. Sports Reference. Retrieved November 4, 2009. ↑ "1976 Minnesota Vikings Starters, Roster, & Players". Pro-Football-Reference.com. Sports Reference. Retrieved November 4, 2009. ↑ "1977 Minnesota Vikings Starters, Roster, & Players". Pro-Football-Reference.com. Sports Reference. Retrieved November 4, 2009. ↑ "1978 Minnesota Vikings Starters, Roster, & Players". Pro-Football-Reference.com. Sports Reference. Retrieved November 4, 2009. ↑ "1979 Minnesota Vikings Starters, Roster, & Players". Pro-Football-Reference.com. Sports Reference. Retrieved November 4, 2009. ↑ "1980 Minnesota Vikings Starters, Roster, & Players". Pro-Football-Reference.com. Sports Reference. Retrieved November 4, 2009. ↑ "1981 Minnesota Vikings Starters, Roster, & Players". Pro-Football-Reference.com. Sports Reference. Retrieved November 4, 2009. ↑ "1982 Minnesota Vikings Starters, Roster, & Players". Pro-Football-Reference.com. Sports Reference. Retrieved November 4, 2009. ↑ "1983 Minnesota Vikings Starters, Roster, & Players". Pro-Football-Reference.com. Sports Reference. Retrieved November 4, 2009. ↑ "1984 Minnesota Vikings Starters, Roster, & Players". Pro-Football-Reference.com. Sports Reference. Retrieved November 4, 2009. 1 2 "Archie Manning". Pro-Football-Reference.com. Sports Reference. Retrieved November 4, 2009. ↑ "1985 Minnesota Vikings Starters, Roster, & Players". Pro-Football-Reference.com. Sports Reference. Retrieved November 4, 2009. ↑ "1986 Minnesota Vikings Starters, Roster, & Players". Pro-Football-Reference.com. Sports Reference. Retrieved November 4, 2009. ↑ "1987 Minnesota Vikings Starters, Roster, & Players". Pro-Football-Reference.com. Sports Reference. Retrieved November 4, 2009. 1 2 "Tony Adams". Pro-Football-Reference.com. Sports Reference. Retrieved November 4, 2009. ↑ "1988 Minnesota Vikings Starters, Roster, & Players". Pro-Football-Reference.com. Sports Reference. Retrieved November 4, 2009. ↑ "1989 Minnesota Vikings Starters, Roster, & Players". Pro-Football-Reference.com. Sports Reference. Retrieved November 4, 2009. ↑ "1990 Minnesota Vikings Starters, Roster, & Players". Pro-Football-Reference.com. Sports Reference. Retrieved November 4, 2009. ↑ "1991 Minnesota Vikings Starters, Roster, & Players". Pro-Football-Reference.com. Sports Reference. Retrieved November 4, 2009. ↑ "1992 Minnesota Vikings Starters, Roster, & Players". Pro-Football-Reference.com. Sports Reference. Retrieved November 4, 2009. 1 2 3 "Sean Salisbury". Pro-Football-Reference.com. Sports Reference. Retrieved November 4, 2009. ↑ "1993 Minnesota Vikings Starters, Roster, & Players". Pro-Football-Reference.com. Sports Reference. Retrieved November 4, 2009. ↑ "1994 Minnesota Vikings Starters, Roster, & Players". Pro-Football-Reference.com. Sports Reference. Retrieved November 4, 2009. ↑ "1995 Minnesota Vikings Starters, Roster, & Players". Pro-Football-Reference.com. Sports Reference. Retrieved November 4, 2009. ↑ "1996 Minnesota Vikings Starters, Roster, & Players". Pro-Football-Reference.com. Sports Reference. Retrieved November 4, 2009. ↑ "1997 Minnesota Vikings Starters, Roster, & Players". Pro-Football-Reference.com. Sports Reference. Retrieved November 4, 2009. ↑ "1998 Minnesota Vikings Starters, Roster, & Players". Pro-Football-Reference.com. Sports Reference. Retrieved November 4, 2009. ↑ "1999 Minnesota Vikings Starters, Roster, & Players". Pro-Football-Reference.com. Sports Reference. Retrieved November 4, 2009. ↑ "2000 Minnesota Vikings Starters, Roster, & Players". Pro-Football-Reference.com. Sports Reference. Retrieved November 4, 2009. ↑ "2001 Minnesota Vikings Starters, Roster, & Players". Pro-Football-Reference.com. Sports Reference. Retrieved November 4, 2009. 1 2 "Todd Bouman". Pro-Football-Reference.com. Sports Reference. Retrieved November 4, 2009. 1 2 "Spergon Wynn". Pro-Football-Reference.com. Sports Reference. Retrieved November 4, 2009. ↑ "2002 Minnesota Vikings Starters, Roster, & Players". Pro-Football-Reference.com. Sports Reference. Retrieved November 4, 2009. ↑ "2003 Minnesota Vikings Starters, Roster, & Players". Pro-Football-Reference.com. Sports Reference. Retrieved November 4, 2009. ↑ "2004 Minnesota Vikings Starters, Roster, & Players". Pro-Football-Reference.com. Sports Reference. Retrieved November 4, 2009. ↑ "2005 Minnesota Vikings Starters, Roster, & Players". Pro-Football-Reference.com. Sports Reference. Retrieved November 4, 2009. ↑ "2006 Minnesota Vikings Starters, Roster, & Players". Pro-Football-Reference.com. Sports Reference. Retrieved November 4, 2009. ↑ "2007 Minnesota Vikings Starters, Roster, & Players". Pro-Football-Reference.com. Sports Reference. Retrieved November 4, 2009. 1 2 "Kelly Holcomb". Pro-Football-Reference.com. Sports Reference. Retrieved November 4, 2009. 1 2 "Brooks Bollinger". Pro-Football-Reference.com. Sports Reference. Retrieved November 4, 2009. ↑ "2008 Minnesota Vikings Starters, Roster, & Players". Pro-Football-Reference.com. Sports Reference. Retrieved November 4, 2009. ↑ "2009 Minnesota Vikings Starters, Roster, & Players". Pro-Football-Reference.com. Sports Reference. Retrieved January 8, 2010. ↑ "2010 Minnesota Vikings Starters, Roster, & Players". Pro-Football-Reference.com. Sports Reference. Retrieved January 2, 2011. 1 2 3 "Joe Webb". Pro-Football-Reference.com. Sports Reference. Retrieved January 2, 2011. ↑ "2011 Minnesota Vikings Starters, Roster, & Players". Pro-Football-Reference.com. Sports Reference. Retrieved October 24, 2011. 1 2 "Donovan McNabb". Pro-Football-Reference.com. Sports Reference. Retrieved January 3, 2013. 1 2 3 "Christian Ponder". Pro-Football-Reference.com. Sports Reference. Retrieved November 20, 2013. ↑ "2012 Minnesota Vikings Starters, Roster, & Player". Pro-Football-Reference.com. Sports Reference. Retrieved January 3, 2013. ↑ "2013 Minnesota Vikings Starters, Roster, & Player". Pro-Football-Reference.com. Sports Reference. Retrieved January 3, 2013. 1 2 3 "Matt Cassel". Pro-Football-Reference.com. Sports Reference. Retrieved November 20, 2013. 1 2 "Josh Freeman". Pro-Football-Reference.com. Sports Reference. Retrieved November 12, 2013. 1 2 3 4 "Teddy Bridgewater". Pro-Football-Reference.com. Sports Reference. Retrieved September 28, 2014. 1 2 "Sam Bradford". Pro-Football-Reference.com. Sports References. Retrieved September 19, 2016. 1 2 "Shaun Hill". Pro-Football-Reference.com. Sports Reference. Retrieved September 11, 2016. 1 2 3 4 "Minnesota Vikings Career Passing Register". Pro-Football-Reference.com. Sports Reference. Retrieved November 25, 2009. ↑ "Chicago Bears at Minnesota Vikings - November 30th, 2008". Pro-Football-Reference.com. Sports Reference. Retrieved November 25, 2009. 1 2 "Minnesota Vikings Career Rushing Register". Pro-Football-Reference.com. Sports Reference. Retrieved November 25, 2014. ↑ "Minnesota Vikings at Detroit Lions - December 11th, 2011". Pro-Football-Reference.com. Sports Reference. Retrieved November 25, 2014.